“Theft” in New Jersey means to unlawfully take or exercise control over property belonging to someone else with purpose to deprive the other person of that property. The New Jersey statute that defines theft is N.J.S. 2C:20-3. Under New Jersey law, a person can be convicted of theft even when the property was not actually taken from one place to another. It is sufficient if the property is moved from its original location, or even if the defendant just exercised unlawful control over it. It is thus possible to commit theft by exercising control over property when the person is unable to actually move it. New Jersey defines “property” broadly. It can mean anything of value. This includs tangible and intangible personal property, trade secrets, contract rights, choses in action and other interests in or claims to wealth, admission or transportation tickets, captured or domestic animals, food and drink, electric, gas, steam or other power, financial instruments, information, data, and computer software. It includes things growing on, affixed to, or found in land. It includes documents, even when the rights represented thereby have no physical location. “Property of another” means property in which any person other than the defendant has an interest, and which the defendant is not privileged to infringe. It can sometimes include property in which the defendant himself also has an interest. It can be property in which the other person might be precluded from civil recovery because the property was used in an unlawful transaction or was subject to forfeiture as contraband. New Jersey defines the term “property of another” broadly, so as to include services and intangibles, anything of value. “Theft” in New Jersey can also take other forms. For example, when a person receives propery from someone else while knowing that that property was stolen, New Jersey considers that receiver to be guilty of theft. New Jersey calls this particular kind of theft “receiving stolen property.” This form of theft is described at N.J.S. 2C:20-7. Still another kind of theft occurs when a person obtains property lawfully, but with an obligation to do a particular thing with that property. The person then fails to perform that obligation. For example, a cashier in a store receives money from a customer making a purchase. The cashier is required, of course, to put the money in the cash register. But she may, instead, put it in her pocket with the intention of depriving the store owner of that money. This is called theft by failure to make proper disposition. This form of theft is specified in N.J.S. 2C:20-9. Another activity recognized as theft is “theft by deception.” Theft by deception occurs when a person obtains property from another by some kind of falsehood, or trickery. For example, an unscrupulous jeweler may sell a fake diamond to a customer, telling the customer that the diamond was real. The jeweler knows the diamond was fake, but the customer, obviously, does not. Theft by deception is treated in N.J.S. 2C:20-4. Still another kind of theft in New Jersey is shoplifting. We consider shoplifting in great detail elsewhere on this site. Yet another kind of theft is “theft of services.” Theft of services covers a huge range of offenses. One example of this is tampering with a utility meter to record less than the amount actually received of whatever it is that the meter measures. Another example might be obtaining medical care, or veterinary care, with the intention of not paying for the value of those services. 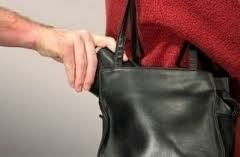 Theft in New Jersey is a disorderly persons offense when the value of whatever was taken is less than $200.00. Between $200.00 and $500.00, it is a fourth degree offense. From $500.01 to $75,000.00, it is a third degree offense. If the value of what was taken exceeds $75,000.00, it becomes a second degree offense. Unlawful taking of some items will be a third degree offense even when the value of the items is $500.00 or less. When the item unlawfully taken is a car, for example, it will be a third degree theft regardless of the age or condition of the car. Similarly, if the item taken is a blank prescription form from a doctor's office, that will be a third degree offense. These are just two examples. There are others. Returning to the car example, if the value of the car exceeds $75,000.00, the person can be charged with second degree theft. This charge would be based upon the fact that the value exceeds $75,000.00. The fact that what was taken was a car, in that example, does not protect the person from being charged with a second degree crime. The person convicted of theft will suffer. So will his family. For these reasons, if you are charged with any kind of theft, including shoplifting, get a lawyer. Criminal Lawyers in New Jersey have extensive experience successfully defending persons charged with theft. Their representation may help avoid consequences of a conviction that will haunt for many years and, possibly, a lifetime. Page last updated 20 August 2017, and displayed Thursday 18 April 2019, at 06:18:47 EDT.